Argo Navis, with diminutive mizzen and quaint spritmast, sails a crowded southern sky around the year 1660. 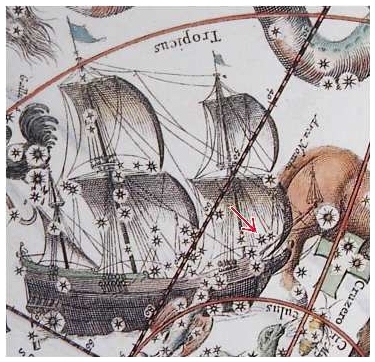 Later constellation enthusiasts placed Eta Argus in the keel ("Carina", same root as "careen"); but in this old map by Andreas Cellarius, Eta is about to set fire to the foresail where we've marked it with an alarming red arrow. This is a mirror image compared to modern star maps. That's Canopus under the captain's cabin, and the bright-looking star near the bowspirit is merely Delta Centauri. Caveat -- Explanations, data, and history given in the sites linked below are reasonably correct in most cases but not all. Since this topic is relatively unfamiliar to most astronomers, misleading statements often occur. Therefore exercise caution regarding what you read on www sites, even those of leading scientific institutions. Eta Car is located in the Great Carina Nebula, NGC 3372, a famous star-formation region almost 2.3 kpc (7500 lightyears) away. The Keyhole Nebula (NGC 3324) is an expanding dark nebula within the Great Carinae Nebula just northwest of Eta Carinae. Eta Carinae is the most massive of a number of very massive young stars which ionize the gas in this region. Here are a few digrams that point out the main features of interest in the Great Carina Nebula. The enitire Great Carina Nebula is too large to image entirely with the HST, but you can find find ground-based pictures at the following places. The number in each label is the approximate angular width of that image in minutes of arc. All these are oriented with north at the top, east to the left (approximately). A mosaic of HST/WFPC2 data shows just part of the "Keyhole Nebula" within NGC 3372; the second figure in an STScI page. It shows the same details as the AAT 006 image cited above. A near-infrared (2 micron) image of the region can be found at the 2MASS site. Today we can obtain much better ground-based images because techniques and telescope sites have improved, while Eta has grown brighter and the Homunculus has expanded. This object is considerably more spectacular today, seen through a moderate-size telescope, than it was 20 years ago. Few astronomers realize this, since large modern instruments generally don't allow non-electronic viewing. An ESO page has a modern ground-based VLT image which shows the outer ejecta. The first really successful color WFPC2 picture of Eta was produced in 1996 by Jon Morse using data obtained in Davidson's early HST programs. You can find it at various 'net sites including HST news '96, Morse, SEDS, and '90s hits. With its bipolar lobes plus equatorial debris, that image inspired a change of style for space explosions in Hollywood films of the late 1990's. We suspect it may even have influenced fireworks design. Note, however, that the top picture on Morse's page is a different version adapted to show faint ejecta outside the Homunculus proper. * It also appears on a SEDS page. However, the outer ejecta are large enough to do well with modern ground-based techniques; see the ESO/VLT image mentioned above. Grayscale image with a simple astrometric grid (799 x 799 GIF, 236 kB), perhaps showing small details better than the color versions. Here the grid spacing is 1 arcsec, coordinate orientation is J2000, and the central star's position is marked. To allow for expansion, note that most of the visible features were ejected from the star around 1843, the expansion velocities have been nearly constant since that time, and this WFPC(PC) image is dated 1995.75. It used filter F631N. By mapping the velocity of different parts of the nebula one can generate a kind of three dimensional veiw of the nebula. Here are some three-dimensional image sets made with HST/STIS in that manner (even though it's a spectrograph, not an imager!) Think of those images as being like several slices through the nebula, like a doctor might do with a CAT scan of your brain to see inside it. Soon after obtaining comparable WFPC2 data at two different epochs, we made a difference image which showed the expansion of the Homunculus in a two-year interval. It doesn't look quite like the familiar sort of astronomical picture. A famous AXAF/Chandra X-ray image shows thermal radiation produced by shocks: a hot central source and slower extended ejecta. Radio images (wavelengths ~ a few cm) can be found at Duncan and White.